Making good level of detail ( LOD ) even for a professional artist can be hard work. You’ve got to try and make each LOD transition look very similar to the previous LOD transition while taking into account the distance at which that LOD will be shown on the screen. LOD0 mesh has 2k polys and is rendered from 0 to 10 meters. LOD1 mesh has 1k polys and is rendered from 10 to 20 meters. 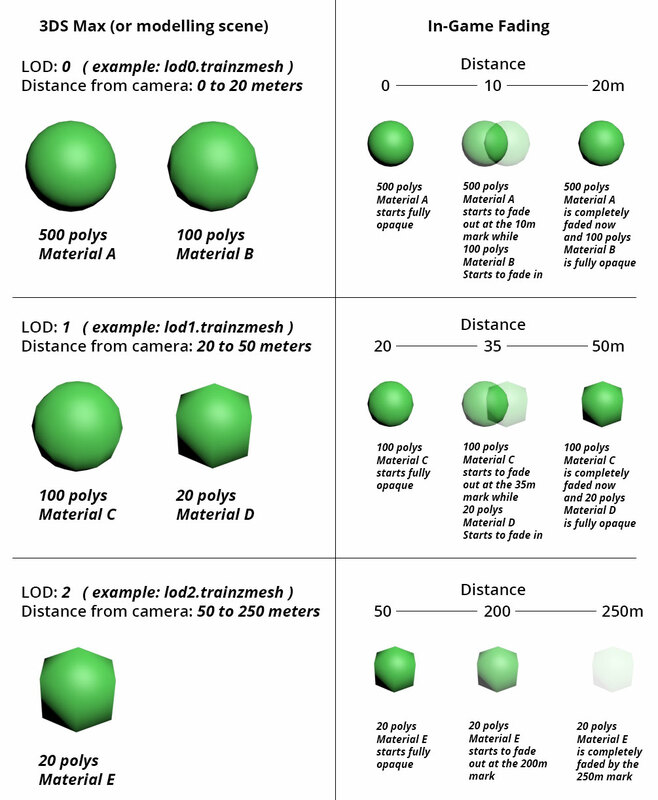 LOD2 mesh has 400 polys and is rendered from 20 to 30 meters. LOD3 mesh has 100 polys and is rendered from 30 to 500 meters. 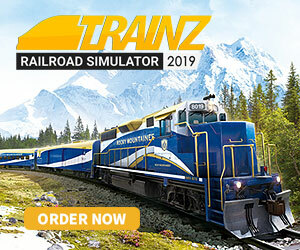 With the standard Trainz LOD system you couldn’t normally be as aggressive with the distances mentioned above, as the change would be too noticeable given the changes in the meshes. For the TRS18 clutter effect, we offer new crossfade LOD transitions which mask any obvious mesh swaps by fading one mesh into the other over a certain distance. m.clutter is a variation on the m.pbrmetalmasked material. It adds controlled fade distances which are intended to allow cross-fading between LODs. Cross-fading is expected to increase the cost of each LOD, but improve the visual transitions. The intent is that transitions can occur much closer to the camera, saving performance overall. 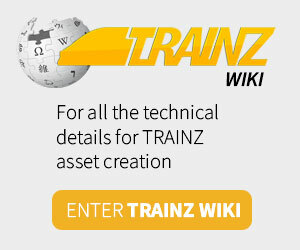 If your use-case does not allow transitions to occur close to the camera, you may find that this material type is inappropriate for your needs. The typical use case is something which is small and heavily repeated in the scene, which requires high detail (eg. 100-500 polygons) at very close ranges (eg. up to about 10m) after which it can rapidly lose detail (eg. 500->100->10 or 100->25->5). LOD0 – 0 .. 20m – Material A (no fade in, fade out begins at 10m) using 500 polygons. Material B (fade in begins at 10m, no fade out) using 100 polygons. Totals: 2 materials, 600 polygons. LOD1 – 20 .. 50m – Material C (no fade in, fade out begins at 35m) using 100 polygons. Material D (fade in begins at 35m, no fade out) using 20 polygons. 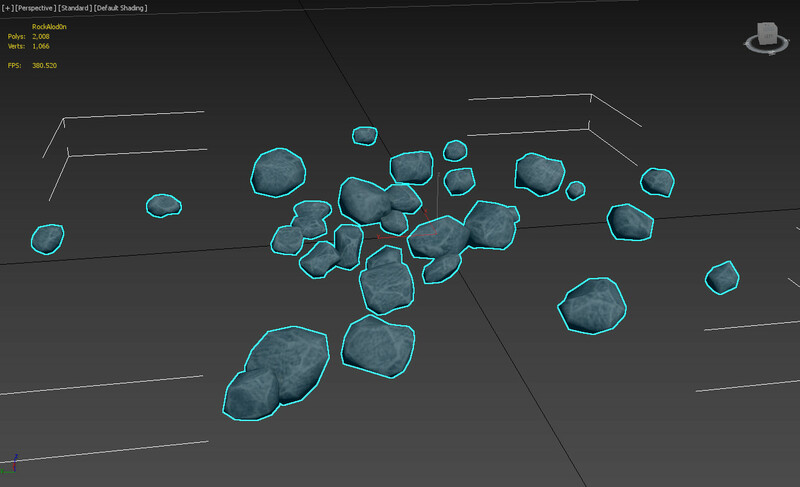 Totals: 2 materials, 120 polygons. LOD2 – 50m .. 250m – Material E (no fade in, fade out begins at 200m) using 20 polygons. 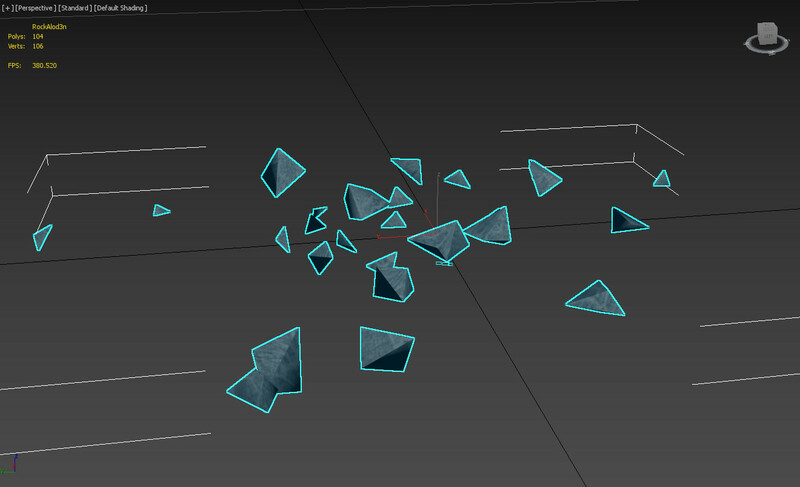 Totals: 1 material, 20 polygons. LOD0 – 0 .. 50m – Material A using 500 polygon mesh. Totals: 1 material, 1 mesh – 500 polygons. LOD1 – 50m .. 150m – Material A using 100 polygon mesh. Totals: 1 material, 1 mesh – 100 polygons. 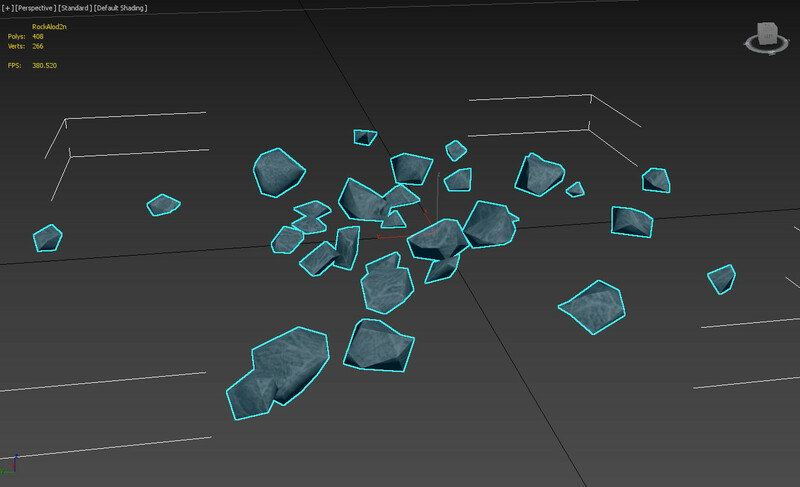 LOD2 – 150m .. 400m – Material A using 20 polygon mesh. Totals: 1 material, 1 mesh – 20 polygons. Cross-faded: 7540 + 7917 + 37699 = 53156 polygons, 5 draw calls (due to 5 materials in use). Traditional: 39270 + 62832 + 86393 = 188495 polygons, 5 draw calls (due to 3 materials in use, two of which require two chunks due to excess vertices). Please note that this technique requires explicit work by the creator. It’s not hard to use, but you do need to provide appropriately configured meshes. It’s also only available on the m.clutter material (used for the Clutter Effect Layer) at this time.